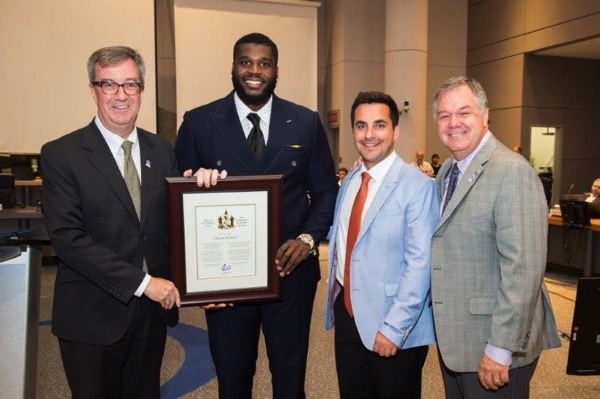 Christo Bilukidi grew up in Ottawa Community Housing’s (OCH) Russell Heights neighbourhood in a single-parent, immigrant household. He was taught the values of hard work and perseverance from a young age, and applied these values when playing football for the first time in the 12th grade. Christo had a natural affinity for the sport, and pushed himself to train hard, eventually trying out and writing SATs to earn a full scholarship to play football at Georgia State University. Christo was soon drafted into the NFL and played for the Oakland Raiders, the Cincinnati Bengals, and the Baltimore Ravens. Christo played in the NFL for five season, eventually deciding to retire and become an entrepreneur. He now co-owns a successful tailored suit business, Idlewood. In his free time, Christo volunteers in his community and is dedicated to giving back to his hometown. Christo is an OCH Tenant Ambassador – he uses his experience, both growing up at OCH and becoming an NFL player to inspire youth and be a positive role model. He has held football camps, free of charge, for youth in low-income communities and often takes on public speaking opportunities at high schools and community centres to help empower as many young people as possible.